Cash Mob Sherwood Oregon - Hit List! Cash Mob Sherwood is organizing its sixth “Cash Mob” event this Saturday, Aug 11th at 11:00am in Sherwood. The growing group of local residents and fellow business owners welcome everyone to join the monthly movement by showing-up and participating. 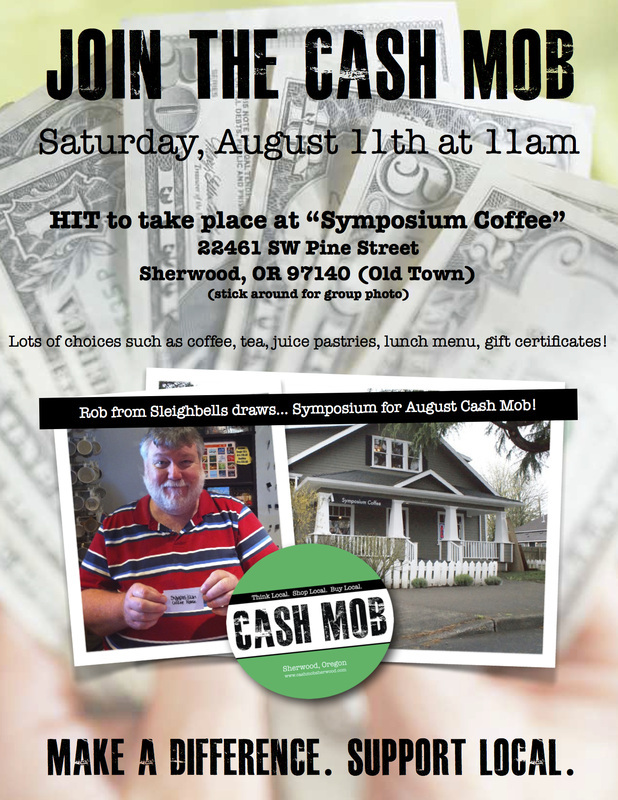 This months mob will take place at Symposium Coffee House in Old Town, recently awarded “Small Business of the Year” 2011-2012 by the Sherwood Chamber of Commerce and Visitors Center for their outstanding leadership, this makes a great opportunity to come out and give this locally owned coffee shop a shot of support! As part of their Shop Local movement, Cash Mob Sherwood, organized by local resident and businessperson Amber Gardner, co-owner of Gardner Team Real Estate who volunteers alongside many committed local patrons, encourages people who want to participate in their community to show up and refocus at approximately $20 of their current spending to support local businesses instead of buying online or at the big-box chains. Even if you don’t drink coffee, consider buying tea, a fresh baked treat, gift certificate for yourself, a friend or to donate to an upcoming charity auction. Small businesses all over America have seen cash mobs pop up in their hometowns. Sherwood businesses have welcomed the mob with open arms as they typically see double normal sales if not much more on a given cash mob day. While each Sherwood cash mob seems to vary in size from a couple dozen people to over a hundred, the goal is to give local businesses more exposure to the masses while consistently growing the efforts of the mob -- the more people who attend and frequent area establishments equates to greater success in supporting local businesses and the community at large. And, the communities support doesn’t go unnoticed, giveaways are also offered at each cash mob to the first 20 people who make a transaction at Cash Mob Sherwood events. 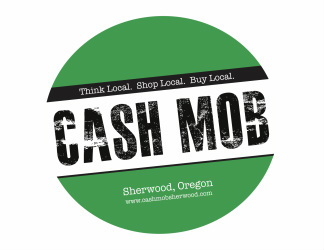 Cash Mobs in Sherwood happen once a month and are part of a call-to-action to stimulate our local economy. Each month the next business to be mobbed is randomly drawn by the previous business hit, giving all local businesses nominated a fair opportunity while adding to the suspense and excitement of each future mob while helping to build a stronger, greater sense of community. 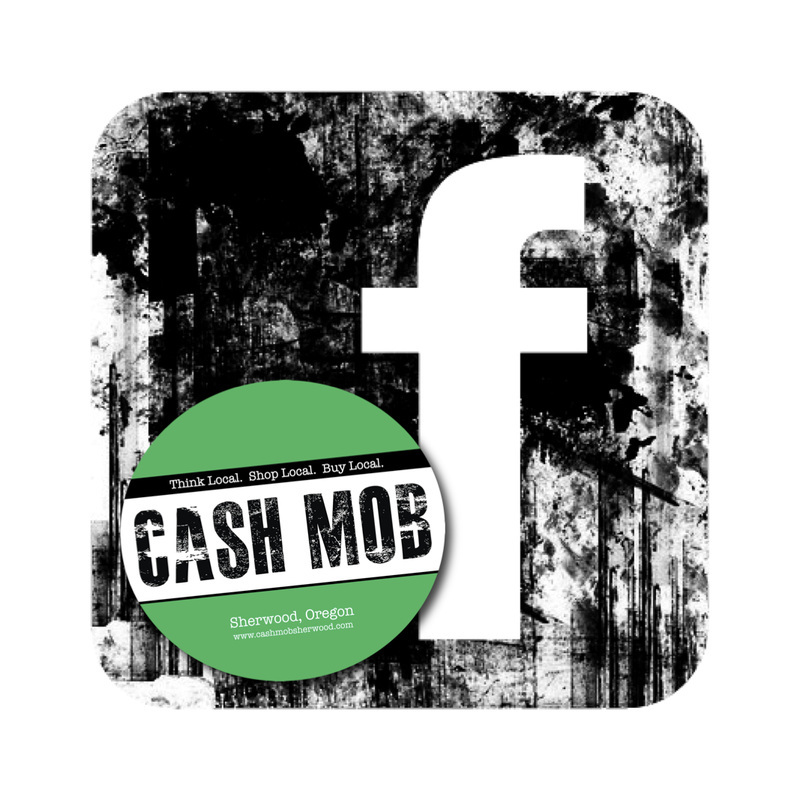 The Sherwood Cash Mob is fueled by social media channels such as Facebook, Twitter and good old fashioned word of mouth. To find out when and where the local Cash Mob will be popping up next, go to www.CashMobSherwood.com and www.facebook.com/cashmobsherwood. You can also email Amber Gardner at amber@gardnerteam.net if you’d like to nominate a locally owned business in Sherwood to be added to the cash mob list. 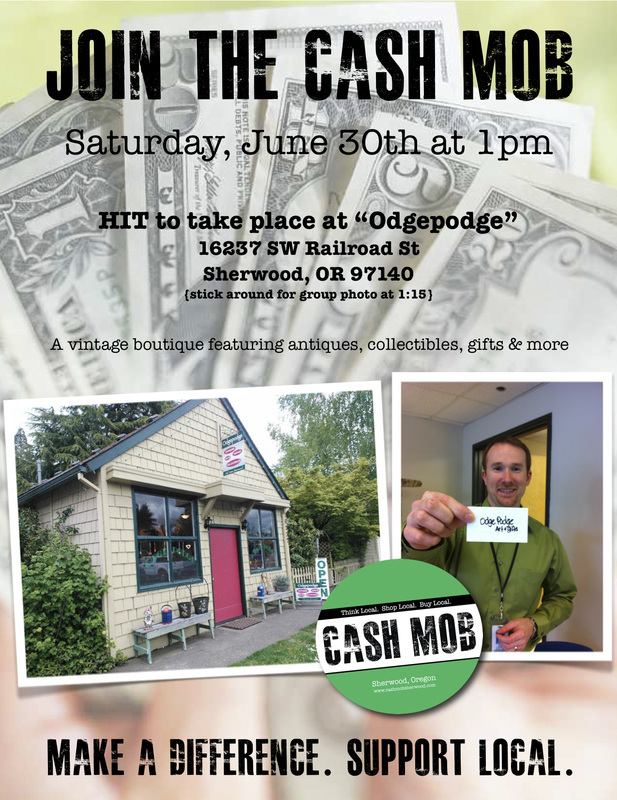 CALLING ALL CASH MOBBERS this Saturday, June 30th at 1:00 to "Odgepodge" on Railroad Street in Old Town Sherwood! Something for everyone, collectibles, antiques, gift items, garden, indoor and outdoor decor, and more... This place is a gem and will be fun for the community to come together not only to experience this place but "hit" them with support! See you there! Help spread the word!! 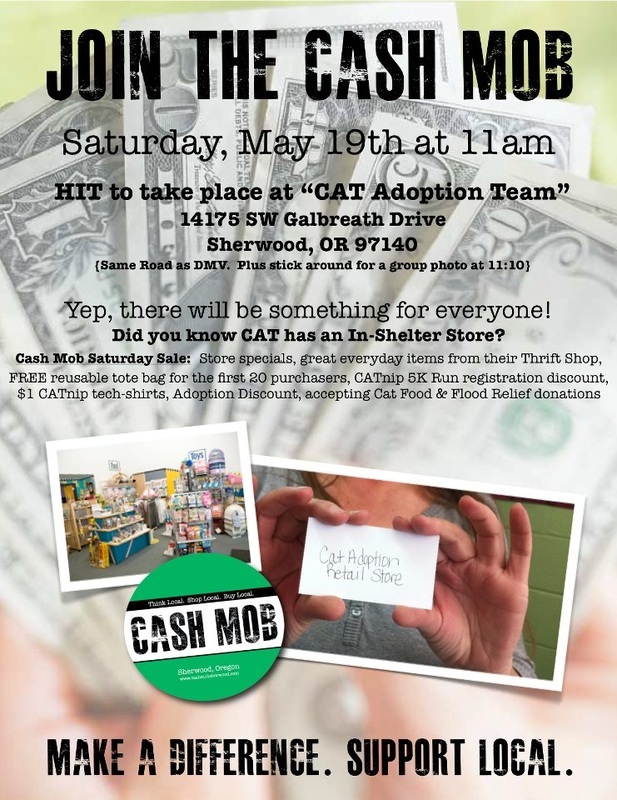 Sherwood Cash Mob Sets Out to HIT Cat Adoption Team! The lucky winner drawn for the 3rd Sherwood Cash Mob is… the CAT ADOPTION TEAMS IN SHELTER RETAIL STORE! We’re looking forward to coming together to “hit” them much deserved support tomorrow! You may have read in the paper or on facebook that they recently experienced a serious flood at the shelter, the retail store was not affected and this mob couldn’t come at a better time for them! SEE YOU TOMORROW AT THE MOB: We’ll start rolling in at 11am and don’t forget to stick around for a group photo! Cash Mob Sherwood Sets Out to "Hit" It's All Arranged! ATTN: MOBBERS!! The second mob has all been arranged! Get ready to bring some green to shower them with support and brighten the day of this locally owned business! 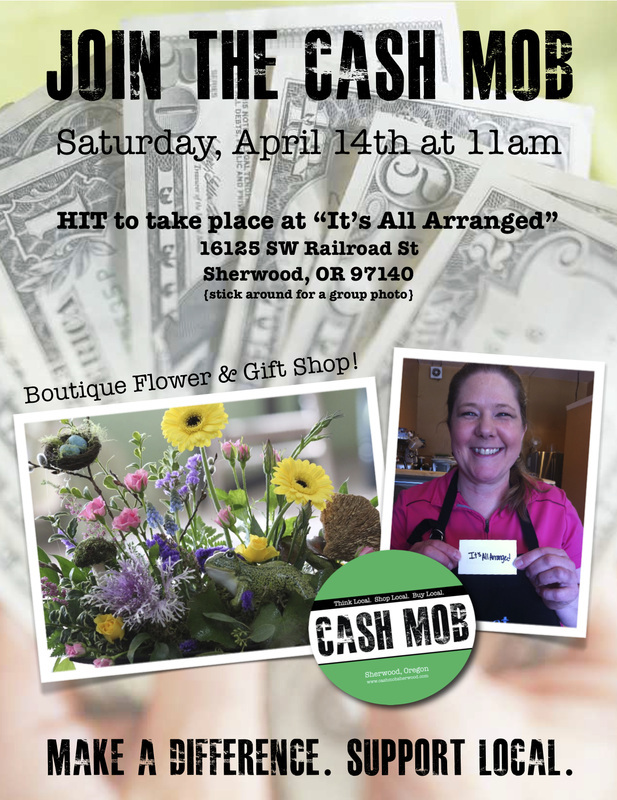 Cash Mob Sherwood set to kick off tomorrow at "IT'S ALL ARRANGED" a flower & gift shop in Old Town Sherwood! We'll all start rolling in at 11am - excited to see you tomorrow!! P.S. Please spread the word, share this post to your wall, tweet about it and text your friends!!! P.S. 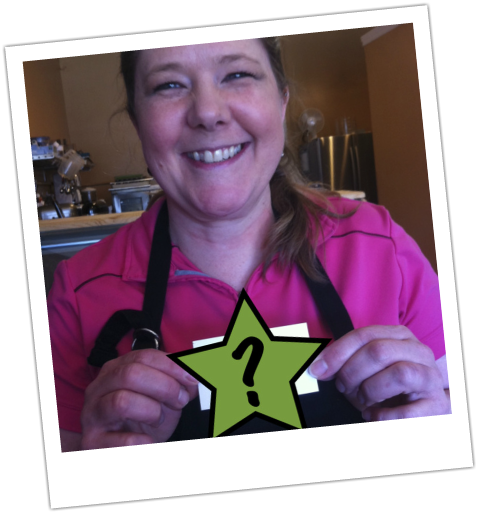 We'd like to thank Michele Howard, owner of SweetStory Bakery for helping Cash Mob Sherwood by randomly selecting the next hit and passing the torch! (Michele is pictured in the Cash Mob Announcement below holding up this months business which she drew in the days following her mob) The cash mobsters can't wait to hit the streets to show some love for our local flower & gift shop! See you there! 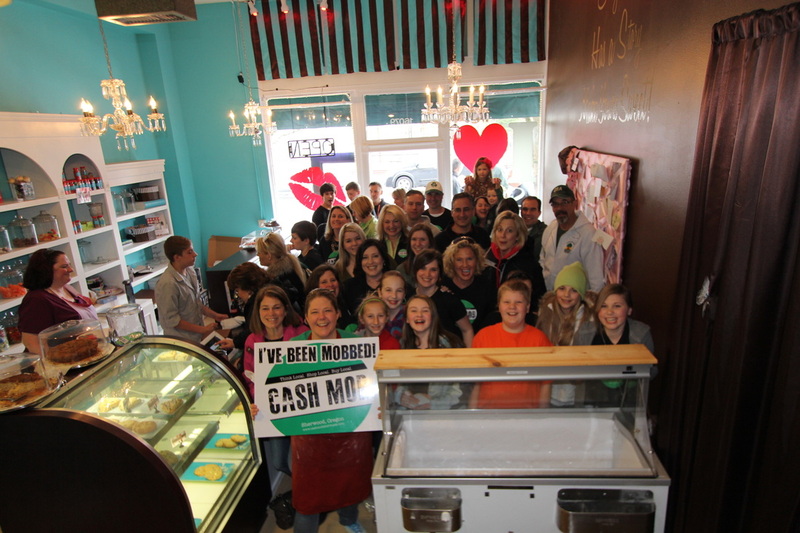 Cash Mob Sherwood's First Hit a Sweet Success! 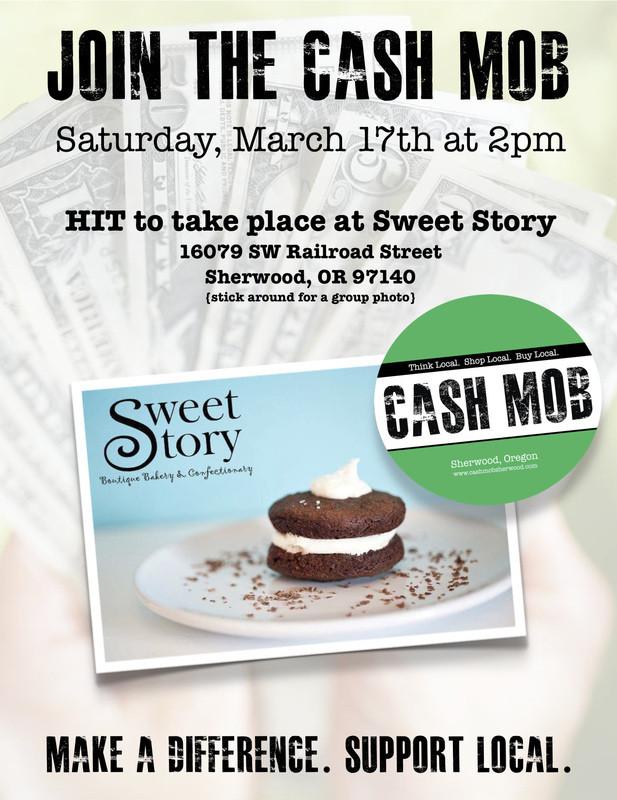 Cash Mob Sherwood's first "hit" was a "hit"
The first mob was scheduled for March 17th. Everyone was asked to start rolling in at 2:00 pm at Sweet Story in Old Town Sherwood and overall, approximately 100 mobbers from all over and of all ages came in to support this locally owned Sherwood business. The aftermath... A VERY FUN and heartwarming experience. The Howard family, owners of Sweet Story in Sherwood and their staff were thrilled with the outcome, and extremely appreciative of the support. People came from all over and many experienced Sweet Story for the first time! While many mobbers came from Sherwood and the surrounding area, there was one specifically that we spoke with who was a student from the University of Oregon. Together with her friends visiting the area, they came by in support of this movement and were one of many who experienced Sweet Story for the first time. They were moved by the communities support and inspired by the idea that this concept could give to their local businesses in the Eugene area the support they need during these tough economic times. They plan to share their experience in Sherwood on Saturday with a leadership group on campus. We wish them much success and are here to help extend support in any way we can! Following the mob we later found out it was Sweet Stories 6 month anniversary when they were mobbed. Michelle Howard, owner of Sweet Story in Sherwood, Oregon said, "it was the best gift she could have asked for!" To really put it in perspective, Sweet Story shared on the Cash Mob Sherwood Facebook wall... "it was the biggest day in sales our store has ever had and that means a lot to Daron and I. It's easy to forget what it takes for small businesses to stay in business but days like yesterday mean that I am able to pay my rent and utilities for another month. I truly appreciate everyone who came out and "mobbed" us!" Sweet Story staff, LeAnn Brown said... "This was amazing! I work at Sweet Story, and I can't tell you how much fun we had serving all of the wonderful people who came out to support Michele and her family. I was still smiling after everyone left! Thanks, Cash Mob and everyone who supports it!" If it had to be summed up in five words, Mobbers YOU made a difference! When we each do a little, we all do a lot! And remember, the more mobbers the merrier! Please follow us on facebook and twitter to see when the next mob is scheduled to take place and which locally owned Sherwood business has been selected. Spread the word to all your friends and get ready rally together to mob them with support! We look forward to seeing you soon!